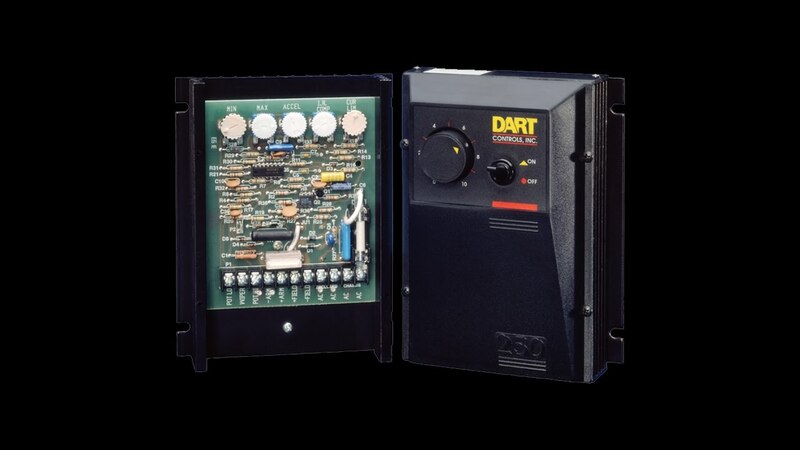 Serial Interfaced Controls – Now Available From Dart! Why not Ethernet? Serial interfaced drives are hosted by a controller that typically already includes Ethernet support. Once the drive is connected to the host, it is effectively connected to Ethernet. This enables very interesting and meaningful possibilities such as remote support, smart phone / tablet apps, and Bluetooth / wireless interface. One interesting application for the BLDC version is as a “poor man’s” servo. Because we have continuous access to set speed, accel and decel rates and via the supervisory controller (see above), timing functions, we can profile motor speed like a servo drive. We will have a wider +/- speed spec than a servo, but for many applications good enough, at significant savings. Serial communications with even small drives allows them to be included in more complex control strategies. This will be a requirement for future plant automation strategies (IIoT), but for now offers significant simplification of hardware platforms (smaller I/O count), greater integration of coordinated systems (ex: packaging line), flexibility of multi-product lines that are recipe driven (changing ingredient ratios by brand), and applications where ambient conditions / raw material variation will change feed rates (ex: food processing). Through serial communication we add the power of the (host) processor to the simplest of motor controls. One subtle yet very real expense in designing systems where control panels are used is the hardware and labor cost of traditional point-to-point wiring. Simple motor speed controls typically offer options to follow analog signal in ‘auto’ mode to change motor speed. However, these are not networked signals, and thus require a direct hard-wire run ($$) from host controller I/O point ($$). Serial communications allow for multi-drop address-driven communication over the same simple twisted pair of wire. The savings in I/O count, labor to install, and the added functionality make a serial comm’s enabled simple DC / BLDC drive worth a serious look.